In applications such as image processing, computer vision or image compression, often times accuracy and precision are less important than processing speed as the input data is noisy and the decision making process is robust against minor perturbations. For instance, the human visual system (HVS) makes pattern recognition decisions even though the data is blurry, noisy or incomplete and lossy image compression is based on the premise that we cannot distinguish minor differences in images. In this project we study the tradeoff between accuracy and system complexity as measured by processing speed and hardware complexity. Knowledge of linear algebra, computer science, and familiarity with software tools such as Matlab or Python is desirable. Familiarity with image processing algorithms is not required. 1. Wu, C. W., "Locally connected processor arrays for matrix multiplication and linear transforms," Proceedings of 2011 IEEE International Symposium on Circuits and Systems (ISCAS), pp.2169,2172, 15-18 May 2011. 2. 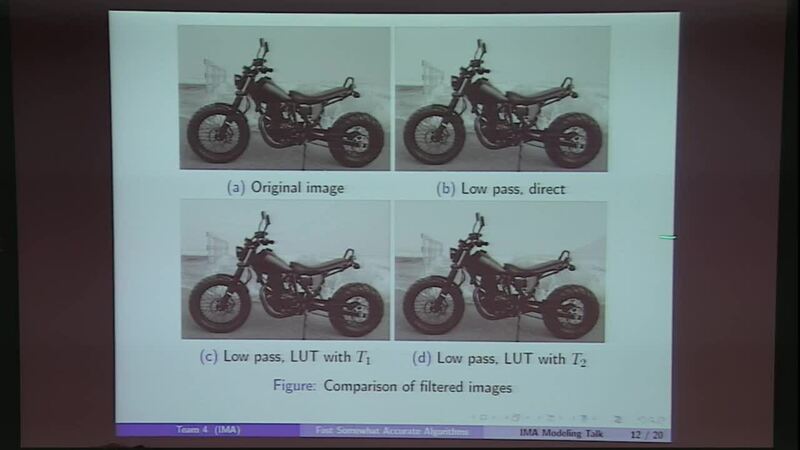 Wu, C. W., Stanich, M., Li, H., Qiao, Y., Ernst, L., "Fast Error Diffusion and Digital Halftoning Algorithms Using Look-up Tables," Proceedings of NIP22: International Conference on Digital Printing Technologies, Denver, Colorado, pp. 240-243, September 2006.